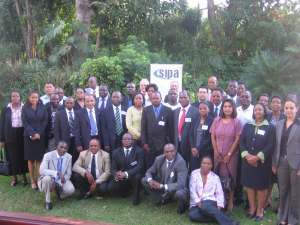 COMESA RIA, in co-operation with the Investment Promotion Agency of Swaziland, organised a Regional Validation Workshop in Swaziland to present the findings and recommendations of a study undertaken to facilitate the adoption of a model set of laws and regulations for Public Private Partnerships (PPP), and also the design of appropriate institutional frameworks in COMESA. During the workshop participants discussed the various levels of PPP readiness in the 19 COMESA countries compared to benchmarks including the example of three best practice COMESA Member States. It also served to disseminate self-diagnosis tools directed at IPAs and road maps based upon observed best practices. Moreover, the workshop presented standardised PPP contracts which are to be complemented with specific provisions relating to the sectors utilities, energy, transports, ports and water supply; and a standardised procurement process. The project and workshop are commissioned and funded by the ACP Business Climate Facility (BizClim) which is an ACP-EU joint initiative financed under the 9th European Development Fund.